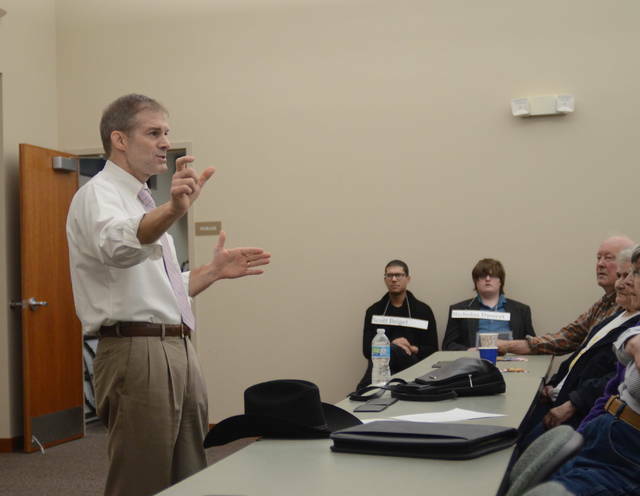 U.S. Rep. Jim Jordan (R-Urbana) offered his perspective on gun rights and other political topics at Tuesday’s Allen County Patriots meeting. 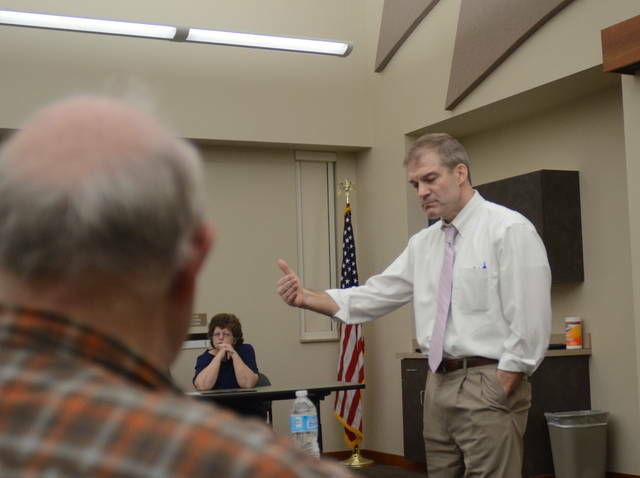 LIMA — U.S. Rep. Jim Jordan (R-Urbana) visited a meeting of the Allen County Patriots Tuesday evening to talk about the issues facing Washington. Although many topics were discussed throughout the night — the national budget, the Nunes memo, immigration, right-to-work laws — the conversation seemed to keep swinging back to the controversial topic of gun laws and the best ways to curb mass shootings. Jordan laid down some of his thoughts early in the night. The majority of the crowd gave the statement their approval, but roughly 20 people — individuals dressed in black who came to the meeting wearing the names of the victims of the Parkland shooting — continued to ask for more clarification, and individuals representing both sides of their issue weren’t pulling punches when discussing their thoughts on the issue. Jordan continued to explain his position. “(There are) hundreds, maybe thousands of laws on the books right now, and that didn’t stop this evil individual Mr. Cruz going and doing the terrible things that he did in Florida. I’m not convinced more laws will in any way help that. In fact, what we know is there were all kinds of — look, hindsight is a little different — but it was like 30-some times that law enforcement interacted with this guy, and he should have been on all kinds of radar screens that there’s a problem here. I think the concern is, the problem is a cultural phenomenon. I think it’s not… I just think it’s bigger,” Jordan said. “The Second Amendment has been with us for as long as we’ve been a country, as long as we had the Constitution, some 200-plus years, and yet this evil mass shooting stuff has already happened relatively recently in our history, and look, per capita, we probably have more guns per capita 25 years ago than we do today,” Jordan said. According to a 2012 report by the Congressional Research Service: “per capita, the civilian gun stock has roughly doubled since 1968, from one gun per every two persons to one gun per person.” The Bureau of Alcohol, Tobacco, Firearms and Explosives also reported in 2015 that the number of guns manufactured per year has tripled from 1986 to 2013. More than once, individuals in the audience linked mass shootings to a bevy of reasons — video games, medication and a lack of good parenting. https://www.limaohio.com/wp-content/uploads/sites/54/2018/02/web1_DSC_7555_crop.jpgU.S. Rep. Jim Jordan (R-Urbana) offered his perspective on gun rights and other political topics at Tuesday’s Allen County Patriots meeting.